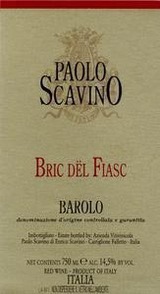 The modern history of the Scavino family starts with this vineyard, within the Fiasco cru. Here the Nebbiolo grapes were always the best: consequently in 1978 young Enrico convinced his father Paolo to vinify these grapes separately. In this way the first, and still most loved cru, was established. Dark in color, with gorgeous aromas of blackberry, black licorice and blueberry. Full-bodied, with supersilky tannins and a long finish. A bit tight, but pretty and balanced. Very long and cerebral. Best after 2012.